PHILADELPHIA, Pennsylvania -- It was a scary scene Saturday night as the Philadelphia Flyers were playing the New Jersey Devils. 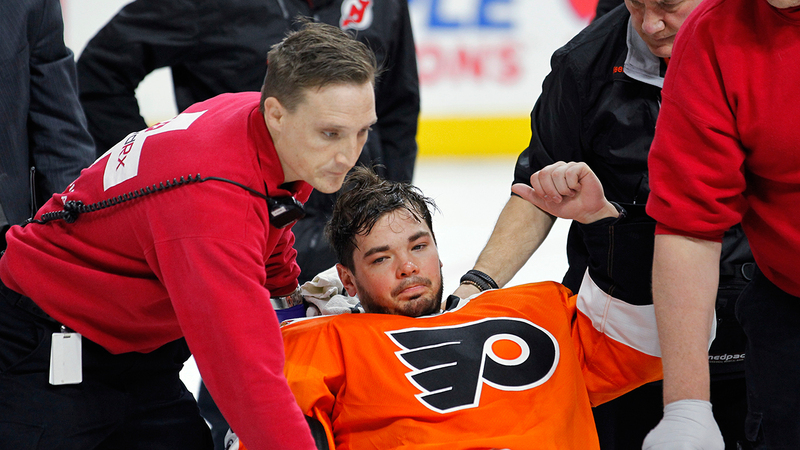 Flyers Goalie Michal Neuvirth collapsed on the ice in the first period. Flyers right winger Colin McDonald says Neuvirth was not feeling well in the locker room before he collapsed, and had to be carted off the ice. Neuvirth was attended to by Flyers trainers and medical staff. He not go with the team to New York to play against the Rangers. According to the Flyers broadcast, he told teammates that he is "OK". Officials say Neuvirth is awake and alert, and is being taken to Pennsylvania Hospital for observation. Serving as emergency backup to goaltender Anthony Stolarz now is Eric Semborski. Semborski is a Temple University graduate and hockey director at the North East Skate Zone in Philadelphia.